These steps show you how to use Azure PowerShell commands to migrate infrastructure as a service (IaaS) resources from the classic deployment model to the Azure Resource Manager deployment model. If you want, you can also migrate resources by using the Azure Command Line Interface (Azure CLI). For background on supported migration scenarios, see Platform-supported migration of IaaS resources from classic to Azure Resource Manager. For detailed guidance and a migration walkthrough, see Technical deep dive on platform-supported migration from classic to Azure Resource Manager. Read through the supported and unsupported features and configurations. If you have virtual machines that use unsupported configurations or features, we recommend that you wait for the configuration/feature support to be announced. Alternatively, if it suits your needs, remove that feature or move out of that configuration to enable migration. If you have automated scripts that deploy your infrastructure and applications today, try to create a similar test setup by using those scripts for migration. Alternatively, you can set up sample environments by using the Azure portal. Application Gateways are not currently supported for migration from classic to Resource Manager. To migrate a classic virtual network with an Application gateway, remove the gateway before running a Prepare operation to move the network. After you complete the migration, reconnect the gateway in Azure Resource Manager. ExpressRoute gateways connecting to ExpressRoute circuits in another subscription cannot be migrated automatically. In such cases, remove the ExpressRoute gateway, migrate the virtual network and recreate the gateway. Please see Migrate ExpressRoute circuits and associated virtual networks from the classic to the Resource Manager deployment model for more information. There are two main options to install Azure PowerShell: PowerShell Gallery or Web Platform Installer (WebPI). WebPI receives monthly updates. PowerShell Gallery receives updates on a continuous basis. This article is based on Azure PowerShell version 2.1.0. For installation instructions, see How to install and configure Azure PowerShell. To perform this migration, you must be added as a co-administrator for the subscription in the Azure portal. On the Hub menu, select Subscription. If you don't see it, select All services. Find the appropriate subscription entry, then look at the MY ROLE field. For a co-administrator, the value should be Account admin. If you are not able to add a co-administrator, then contact a service administrator or co-administrator for the subscription to get yourself added. First, start a PowerShell prompt. For migration, you need to set up your environment for both classic and Resource Manager. Sign in to your account for the Resource Manager model. Set your Azure subscription for the current session. This example sets the default subscription name to My Azure Subscription. Replace the example subscription name with your own. Select-AzSubscription –SubscriptionName "My Azure Subscription"
BadRequest : Subscription is not registered for migration. Make sure that RegistrationState is Registered before you proceed. Now sign in to your account for the classic model. Set your Azure subscription for the current session. This example sets the default subscription to My Azure Subscription. Replace the example subscription name with your own. Select-AzureSubscription –SubscriptionName "My Azure Subscription"
You can use the following PowerShell command to check the current number of vCPUs you have in Azure Resource Manager. To learn more about vCPU quotas, see Limits and the Azure Resource Manager. This example checks the availability in the West US region. Replace the example region name with your own. All the operations described here are idempotent. If you have a problem other than an unsupported feature or a configuration error, we recommend that you retry the prepare, abort, or commit operation. The platform then tries the action again. Get the list of cloud services by using the following command, and then pick the cloud service that you want to migrate. If the VMs in the cloud service are in a virtual network or if they have web or worker roles, the command returns an error message. Get the deployment name for the cloud service. In this example, the service name is My Service. Replace the example service name with your own service name. 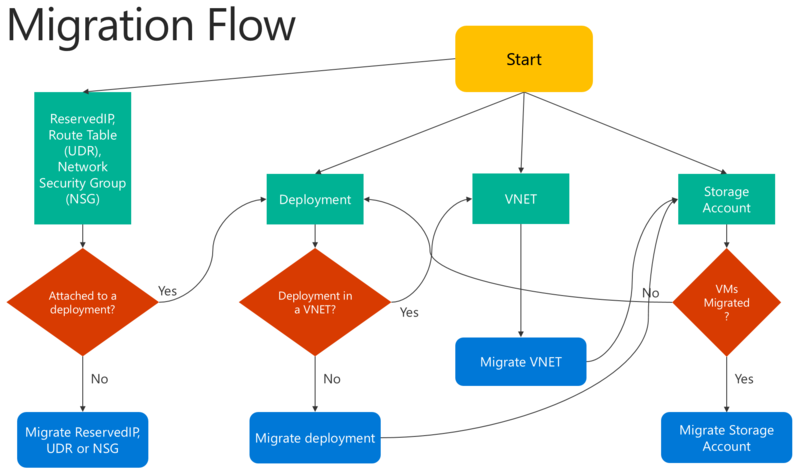 Prepare the virtual machines in the cloud service for migration. You have two options to choose from. This example sets the resource group name to myResourceGroup, the virtual network name to myVirtualNetwork and the subnet name to mySubNet. Replace the names in the example with the names of your own resources. After the Prepare operation succeeds with either of the preceding options, query the migration state of the VMs. Ensure that they are in the Prepared state. This example sets the VM name to myVM. Replace the example name with your own VM name. To migrate virtual machines in a virtual network, you migrate the virtual network. The virtual machines automatically migrate with the virtual network. Pick the virtual network that you want to migrate. Migrate single classic virtual machine by creating a new Resource Manager virtual machine with Managed Disks using the VHD (OS and data) files of the virtual machine. The virtual network name might be different from what is shown in the new Portal. The new Azure Portal displays the name as [vnet-name] but the actual virtual network name is of type Group [resource-group-name] [vnet-name]. Before migrating, lookup the actual virtual network name using the command Get-AzureVnetSite | Select -Property Name or view it in the old Azure Portal. This example sets the virtual network name to myVnet. Replace the example virtual network name with your own. If the virtual network contains web or worker roles, or VMs with unsupported configurations, you get a validation error message. Once you're done migrating the virtual machines, we recommend you perform the following prerequisite checks before you migrate the storage accounts. If your storage account had no associated disks or VM data, you can skip directly to the Validate Storage Account and Start Migration section. The following command returns RoleName and DiskName properties of all the classic VM disks in the storage account. RoleName is the name of the virtual machine to which a disk is attached. If this command returns disks then ensure that virtual machines to which these disks are attached are migrated before migrating the storage account. The following command returns all the VM images with OS disk stored in the storage account. The following command returns all the VM images with data disks stored in the storage account. Validate each storage account for migration by using the following command. In this example, the storage account name is myStorageAccount. Replace the example name with the name of your own storage account.